I know this is like a serial repeat of the belt but I cant help it! I am wearing it so much lately. I bloody love it! So just a I was thinking I can move onto my Spring wardrobe we get pulled back for a few days of real wintery weather. When I shot this outfit it was those few days where there was no sun at all, just raining on and off. 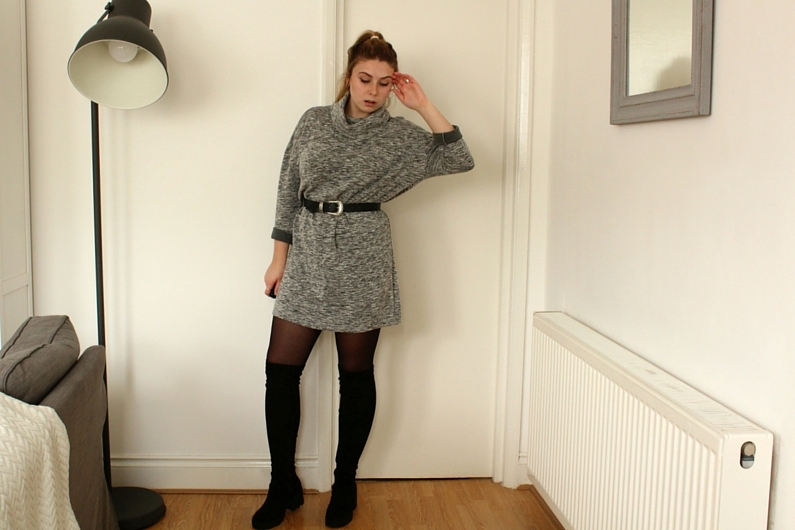 So off I went and pulled out my super warm and cosy River Island jumper dress. Don't get me wrong I will still probably wear this outfit throughout spring and grey is not just a wintery colour (we love grey always!) But I have some new and bits and bobs I've been dying to wear. Annddd I would like to just ditch the tights now please! I apologise for the picture taking situation I have going on at the moment with all the bits in the background. Its driving me crazy but in such a little flat there is not much room for me to go elsewhere.. but I'm working on re-positioning some things to make the picture a little less cluttered, so bear with me. Again I am seriously slacking (blame the dissertation not me) I still haven't been able to add the follow me on Twitter button yet, soo if you would like to follow me click here. If you want to follow me on anything else all the other buttons are up and running!